NYC, 04/08/2019, 6:00PM. Jazz Trumpet. 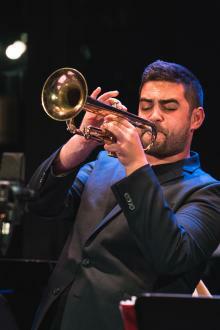 Noah Halpern is a rising trumpet player and composer. He has performed at venues including Dizzy’s Club Coca Cola, Smalls Jazz Club, The Blue Note, Zinc Bar, and Shapeshifter Lab, among others. Noah has toured around the U.S., Europe, Japan, and Australia, playing at festivals including Umbria Jazz Festival, Jazz a Vienne, The Monterrey Jazz Festival, The Nagoya Jazz Festival, and Generations in Jazz. He has shared the stage with a variety of notable artists including Eric Harland, James Morrison, The Jazz at Lincoln Center Orchestra with Wynton Marsalis, Lil Buck, and Paul Anka.